In this introduction to SLA 3D printing, we cover the basic principles of the technology. After reading this article you will understand the fundamental mechanics of the SLA process and how these relate to its benefits and limitations. SLA is famous for being the first 3D Printing technology: its inventor patented the technology back in 1986. If parts of very high accuracy or smooth surface finish are needed, SLA is the most cost-effective 3D printing technology available. Best results are achieved when the designer takes advantage of the benefits and limitations of the manufacturing process. SLA has many common characteristics with Direct Light Processing (DLP), another Vat Photopolymerization 3D printing technology. For simplicity, the two technologies can be treated as equals. The build platform is first positioned in the tank of liquid photopolymer, at a distance of one layer height for the surface of the liquid. Then a UV laser creates the next layer by selectively curing and solidifying the photopolymer resin. The laser beam is focused in the predetermined path using a set of mirrors, called galvos. The whole cross sectional area of the model is scanned, so the produced part is fully solid. When a layer is finished, the platform moves at a safe distance and the sweeper blade re-coats the surface. The process then repeats until the part is complete. After printing, the part is in a green, no-fully-cured state and requires further post processing under UV light if very high mechanical and thermal properties are required. The liquid resin is solidified through a process called photopolymerization: during solidification, the monomer carbon chains that compose the liquid resin are activated by the light of the UV laser and become solid, creating strong unbreakable bonds between each other. The photopolymerization process is irreversible and there is no way to convert the SLA parts back to their liquid form: when heated, they will burn instead of melting. This is because the materials that are produced with SLA are made of thermoset polymers, as opposed to the thermoplastics that FDM uses. Curious about the cost and the available material options of SLA 3D printing? In SLA systems, most print parameters are fixed by the manufacturer and cannot be changed. The only inputs are the layer height and part orientation (the latter determines support location). The typical layer height in SLA ranges between 25 and 100 microns. Lower layer heights capture curved geometries more accurately but increase the build time (and cost) and the probability of a failed print. A layer height of 100 microns is suitable for most common applications. The build size is another parameter that is important for the designer. The build size depends on the type of SLA machine. There are two main SLA machine setups: the top-down orientation and the bottom-up orientation. The top-down SLA printers place the laser source above the tank and the part is built facing up. The build platform begins at the very top of the resin vat and moves downwards after every layer. The bottom-up SLA printers place the light source under the resin tank (see figure above) and the part is built facing upside down. The tank has a transparent bottom with a silicone coating that allows the light of the laser to pass through but stops the cured resin from sticking to it. After every layer, the cured resin is detached from the bottom of the tank, as the build platform moves upwards. This is called the peeling step. 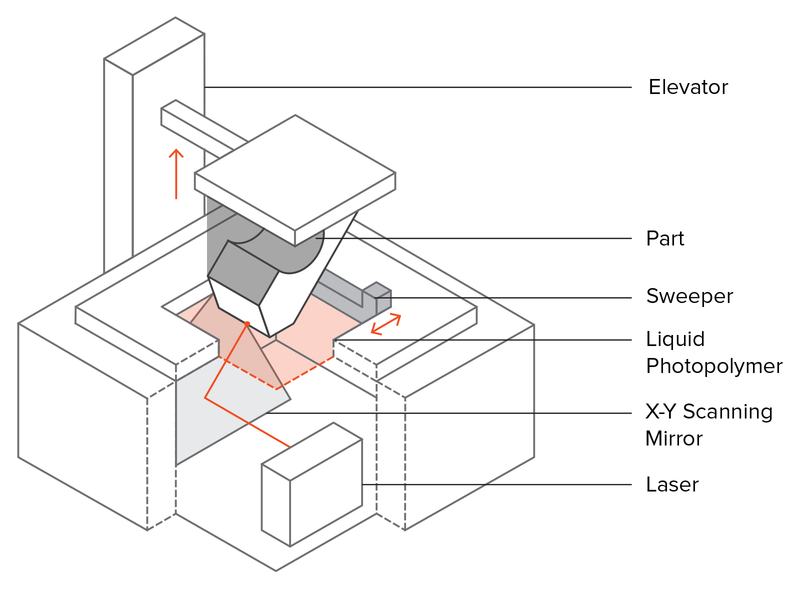 The bottom-up orientation is mainly used in desktop printers, like Formlabs, while the top-down is generally used in industrial SLA systems. 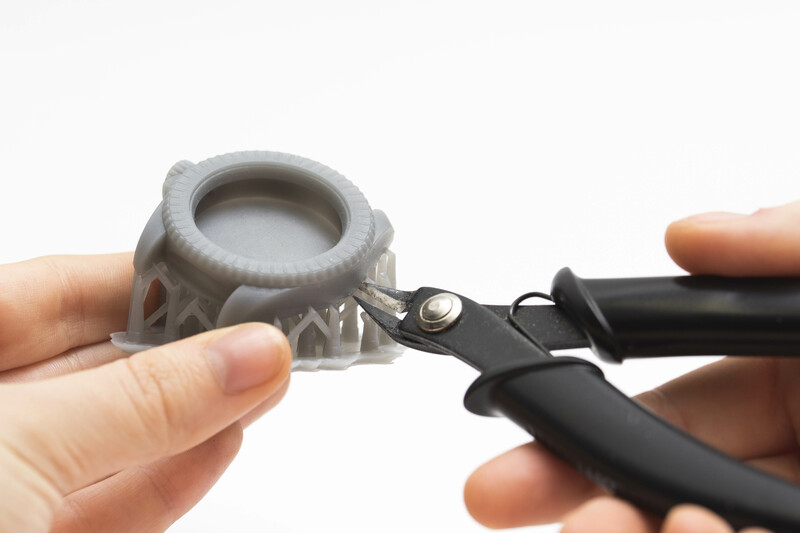 Bottom-up SLA printers are easier to manufacture and operate, but their build size is limited, as the forces applied to the part during the peeling step might cause the print to fail. On the other hand, top-down printers can scale up to very large build sizes without a big loss in accuracy. The advanced capabilities of these systems come at higher costs. Support structure is always required in SLA. Support structures are printed in the same material as the part and must be manually removed after printing. The orientation of the part determines the location and amount of support. It is recommended that the part is oriented so that so visually critical surfaces do not come in contact with the support structures. In top-down SLA printers, support requirements are similar to FDM. They are needed to print accurately overhangs and bridges (the critical overhang angle is usually 30o). The part can be oriented in any position and they are usually printed flat, to minimize the amount of support and the total number of layers. In bottom-up SLA printers, things are more complicated. Overhangs and bridges still need to be supported, but minimizing the cross-sectional area of each layer is the most crucial criterion: the forces applied to the part during the peeling step may cause it to detach from the build platform. These forces are proportional to the cross-sectional area of each layer. For this reason, parts are oriented in an angle and the reduction of support is not a primary concern. One of the biggest problems relating to the accuracy of parts produced via SLA is curling. Curling is similar to warping in FDM. During solidification/curing, the resin shrinks slightly upon exposure to the printer's light source. When the shrinkage is considerable, large internal stresses develop between the new layer and the previously solidified material, which results to curling of the part. In SLA curing continues even after the completion of the printing process. To achieve the best mechanical properties, SLA parts must be post-cured, by placing them in a cure box under intense UV light (and sometimes at elevated temperatures). This improves greatly the hardness and temperature resistance of the SLA part but makes it more brittle. For example, test pieces of parts printed in standard clear resin using a desktop SLA printer have almost 2 times greater tensile strength post-cure (65 MPa compared to 38 MPa) and can operate under load at higher temperatures (at a max temperature of 58oC compared to 42oC), but their elongation at break is almost half (6.2% compared to 12%). Leaving the part in the sun will also induce curing. Extended exposure to UV light has a detrimental effect in the physical properties and appearance of an SLA part: they may curl, become very brittle and change color. For this reason, spray coating with a clear UV acrylic paint before use is highly recommended. SLA materials come in the form of a liquid resin. The price per liter of the resin varies greatly, from about $50 for the standard material, upwards to $400 for the specialty materials, such as the castable or dental resin. Industrial systems offer a wider range of materials than desktop SLA printers, that give the designer a closer control over the mechanical properties of the printed part. SLA materials (thermosets) are more brittle than the materials produced with FDM or SLS (thermoplastics) and for this reason, SLA parts are not usually used for functional prototypes that will undertake significant loading. Advances in materials may change this in the near future. SLA parts can be finished to a very high standard using various post processing methods, such as sanding and polishing, spray coating and finishing with a mineral oil. 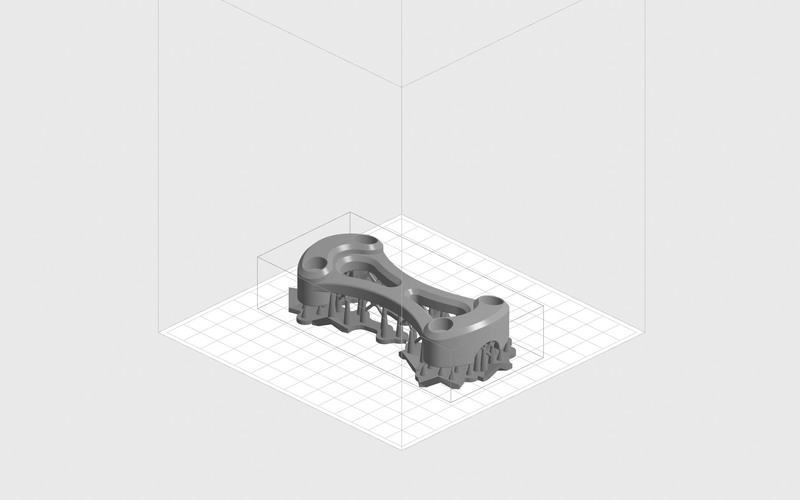 An extensive article on post processing of SLA parts can be found here. SLA can produce parts with very high dimensional accuracy and with intricate details. SLA parts have a very smooth surface finish, making them ideal for visual prototypes. 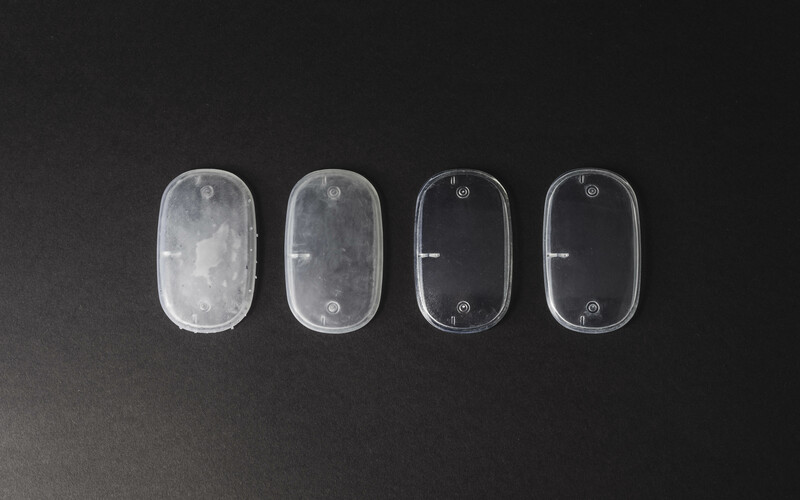 Speciality SLA materials are available, such as clear, flexible and castable resins. SLA parts are generally brittle and not suitable for functional prototypes. The mechanical properties and visual appearance of SLA parts will degrade overtime when the parts are exposed to sunlight. Support structures are always required and post-processing is necessary to remove the visual marks left on the SLA part. SLA is best suited for producing visual prototypes with very smooth surface and very fine details from a range of thermoset materials. Desktop SLA is ideal for manufacturing small ("smaller-than-a-fist") injection molded-like parts at an affordable price. Industrial SLA machines can produce very large parts (as big as 1500 x 750 x 500 mm). 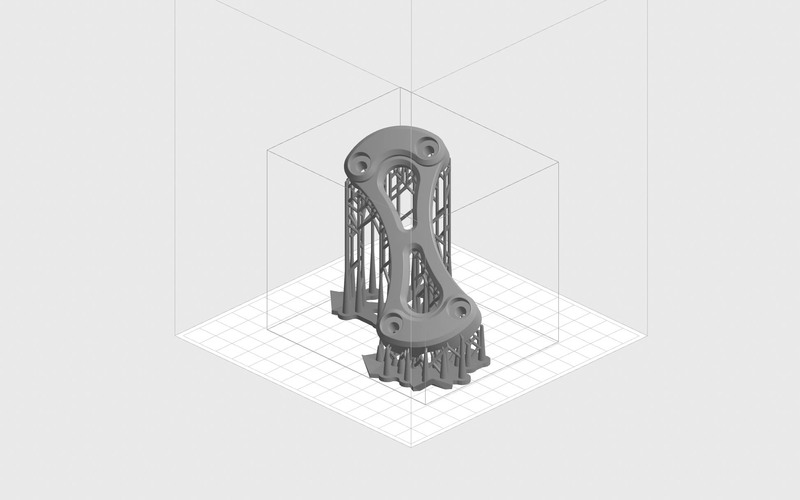 In this introduction to FDM 3D printing, we cover the basic principles of the technology. After reading this article you will understand the fundamental mechanics of the FDM process and how these relate to its benefits and limitations. In this introduction to SLS 3D printing, we cover the basic principles of the technology. After reading this article you will understand the fundamental mechanics of the SLS process and how these relate to its benefits and limitations.